Are you a recordkeeping pack rat? Many individuals and businesses hold onto paper and digital records indefinitely — just in case. But securely storing years of financial records can become burdensome. Here’s some guidance to help minimize recordkeeping overload. Think twice about keeping certain financial records indefinitely. The more records you store, the greater the likelihood that your data will be stolen or hacked. Destroying sensitive documents can reduce the chances that you or your company’s employees and customers will become identity theft victims. 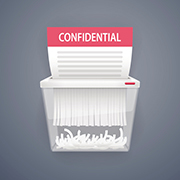 Regardless of whether you’re tossing out personal or business financial documents, always shred them thoroughly first. Also, use proper disposal protocol for any computers and other electronic equipment (such as printers and copiers) that may contain financial data. Simply deleting files using File Manager — or a sledge hammer — isn’t enough. Proper disposal requires a device’s hard drive to be rewritten multiple times. If you fail to use proper disposal techniques, tech-savvy hackers may be able to re-create sensitive data from the device’s hard drive when it is thrown out, donated to a charity or returned to the lessor after the lease term has expired. Outside vendors can help manage your asset disposal needs, but they also can pose additional risks. Your CPA can help you choose a reliable vendor that conducts background checks on employees, offers risk indemnification, tracks assets during the disposal process and ensures that assets are disposed of in an environmentally responsible manner. Most tax advisors recommend that you hold onto copies of your finished tax returns indefinitely. Why? That way, you can prove to the IRS that you actually filed. Even if you don’t keep the returns indefinitely, you should hang onto them for at least six years after they’re due or filed, whichever is later. It’s a good idea to keep records that support items shown on your individual tax return until the statute of limitations runs out — generally, three years from the due date of the return or the date you filed, whichever is later. Examples of supporting documents include canceled checks and receipts for alimony payments, charitable contributions, mortgage interest payments and retirement plan contributions. You can also file an amended return on Form 1040X during this timeframe if you missed a deduction, overlooked a credit or misreported income. Which records can you purge today? You can generally throw out records for the 2014 tax year, for which you filed a return in 2015. You’re not necessarily safe from an IRS audit after three years, however. There are some exceptions to the three-year rule. For example, if the IRS has reason to believe your income was understated by 25% or more, the statute of limitations for an audit increases to six years. Or, if there’s suspicion of fraud or you don’t file a tax return at all, there is no time limit for the IRS to launch an inquiry. In addition, records that support figures affecting multiple years, such as carryovers of charitable deductions, net operating loss carrybacks or carryforwards, or casualty losses, need to be saved until the deductions no longer have effect, plus seven years, according to IRS instructions. There are also some cases when taxpayers get more than the usual three years to file an amended return. For example, you have up to seven years to take deductions for bad debts or worthless securities, so don’t toss out records that could result in refund claims for those items. Important note: Keep in mind that these guidelines are all geared toward complying with federal tax obligations. Check with your tax advisor to learn how long you should keep your state tax records. Some states have different statutes of limitation for auditing tax returns. Your file cabinets probably contain more than just tax information. Some essential records — such as birth and death certificates, marriage licenses, divorce decrees, Social Security cards and military discharge papers — should be kept indefinitely. Other kinds of records can eventually be purged. Here’s some guidance to help individuals decide whether to shred or save other types of financial records. Bills and receipts. For most people, old bills and receipts make up the bulk of what’s in their files. In general, it’s OK to shred most bills — like the phone bill or credit card statement — when your payment clears your bank account or at year end. However, if a bill or receipt supports an item on your tax return, follow the tax guidance above. Or if you purchase a big-ticket item — like jewelry, furniture or a computer — keep the bill for as long as you have the item. You never know if you’ll need to substantiate an insurance claim in the event of loss or damage. Real estate records. Keep these for as long as you own the property, plus three years after you dispose of it and report the transaction on your tax return. Throughout ownership, keep records of the purchase, as well as receipts for home improvements, relevant insurance claims and documents relating to refinancing. These help prove your adjusted basis in the home, which is needed to figure any taxable gain at the time of sale, or to support calculations for rental property or home office deductions. IRAs. The IRS requires you to keep copies of Forms 8606, 5498 and 1099-R until all the money is withdrawn from your IRAs. With the introduction of Roth IRAs, it’s more important than ever to hold onto all IRA records pertaining to contributions and withdrawals in case you’re ever questioned. The record-retention guidelines are slightly different for business records. Here are some best practices for records used to substantiate a business’s payroll, income and sales tax filings. Timecards specifically must be kept for at least three years if your business engages in interstate commerce and is subject to the Fair Labor Standards Act. However, it’s a best practice for all businesses to keep the files for several years in case questions arise. Employment tax records. Keep these for four years from the date the tax was due or the date it was paid, whichever is longer. Before you clear your file cabinets of old financial records, discuss the requirements with your tax advisor. You don’t want to be caught empty-handed if an IRS or state tax auditor contacts you.